In my continuing discussion of commercial aviation, it's time to talk about class. When I say class, I mean class of service. (Disclaimer: I’m most familiar with the US market, and know a bit about Europe. I’m trying to hold down the research I put into these, so I’m sorry if I don’t understand someone else’s aviation market.) But first, let’s talk about the planes themselves. Passenger jets are basically divided into three categories (small to large), regional, narrowbody and widebody. Regional planes are those with up to ~120 seats, and typically fly between major hubs and distant secondary markets or close tertiary markets. The main players are Bombardier and Embraer, both of which make a range of planes from 70-120 seats, and are trying to move into the narrowbody market. For various reasons, these are much more popular in the US than in the rest of the world, but that may not continue going forward, and I suspect that the demise of this market may be behind Embraer and Bombardier looking to build larger planes. Seating ranges from 1-2 (one seat on one side of the aisle, 2 on the other) to 3-3 on some of the largest. Narrowbodies form the backbone of all short to medium-haul flying worldwide. The two main players are the Airbus A320 family and the Boeing 737, although some older planes, such as the MD-80 family and the 757, also survive. These seat 120-250 people, depending on variant, and fly every route from hour-long hops between hubs and secondary markets to transcontinental routes and even an increasing percentage of transatlantic flights. Coach seating is almost always 3-3. Widebodies are almost exclusively used for long-haul flights, ranging from transatlantic and the occasional transcontinental route to flying halfway around the world. As of November 2018, there are 19 flights scheduled to last 16 hours or more.1 Currently, this market is dominated by the Boeing 777 and 787, and the Airbus A330 and A350. The 777 is somewhat larger than the other three, but exact comparisons are complicated by the fact that different airlines install radically different interiors. Some operators fly 777s with 250 seats, while others cram 400 aboard the same airplane. Larger airplanes, the 747 and A380, are pretty niche players at this point, while older widebodies, most notably the 767 and DC-10/MD-11, are being used mostly for cargo. Seating ranges from 2-3-2 to 3-4-3 in coach, while premium cabins have a bewildering variety of configurations. There are also smaller airplanes, mostly turboprops, used as feeders from small airports. These are not important to most flyers, and the picture is complicated enough without them. Economy Class: This is the basic seat you get, also known as coach. It’s usually 17-18” wide, and has a pitch (the distance between a given point on one seat and the seat behind it) of 28-32” depending on the airline. 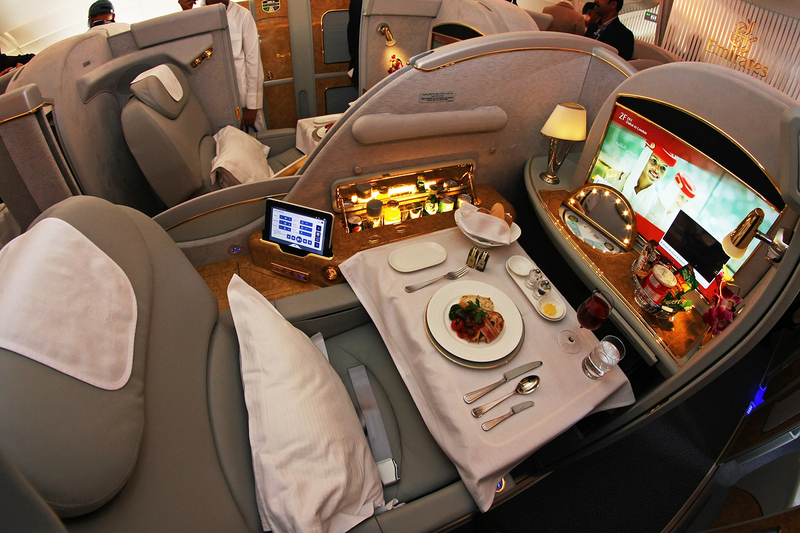 Exact standards of service and amenities vary greatly depending on the airline. Extra-legroom Economy: Sometimes called economy plus (or other names, depending on the airline), this is the same seat you get in Economy, but with more legroom. On US carriers (who are the main users of this class), it’s usually 34-36” pitch, and often comes with priority boarding and maybe a free snack and drink. It’s either a buy-up from economy (and not a separate fare), or assigned to elites. Domestic First/Short-haul Business: This class is usually the higher class of 2-class narrowbodies. The seats are somewhat wider (2-2 instead of 3-3 and about 21”), and with more pitch, usually 38-40” or so. Usually comes with better service, a free meal and drinks. 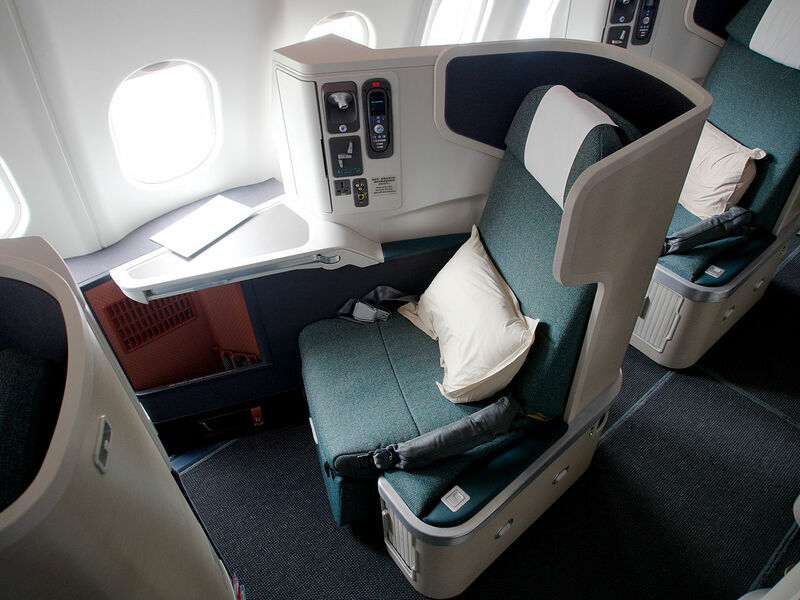 Premium Economy: The longhaul equivalent to domestic first. Usually a slightly wider seat (say going from 3-3-3 to 2-4-2), a pitch of ~38”, and better service. Not all airlines have this, although it’s gradually spreading. International Business: 15 years ago, this wasn’t that different from domestic first, but things have changed a lot. 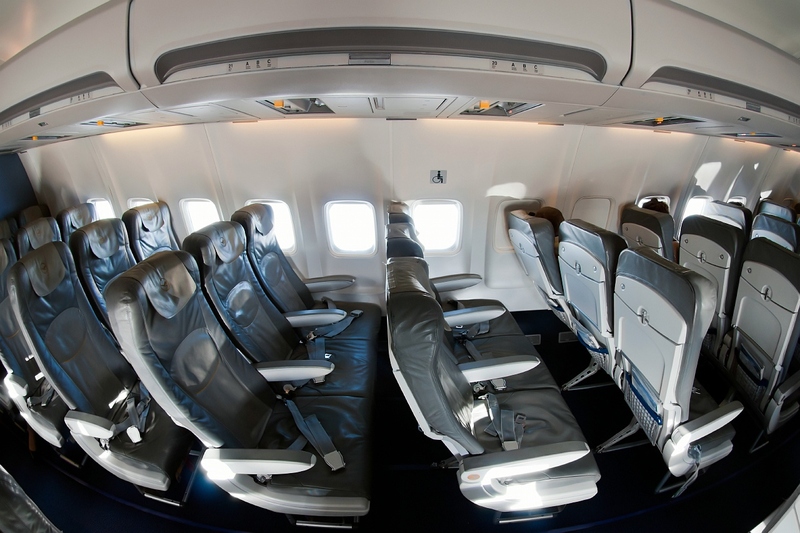 These days, you can expect a fully lie-flat seat about 6’ long, and more and more airlines are moving towards giving every seat direct aisle access. You get free alcohol, generally decent meals (although this varies a lot depending on the airline), and generally a much nicer flight. There are lots of different kinds of seats, some of which are a lot better than others, so check SeatGuru before you book. A lot of airlines (United and Delta among them) are making Business their top class of service, as it is now where first was 15 years ago, and (particularly in the US) there just isn’t that much demand for first. I’ve gotten to fly business once, and it was really cool. International First: On any airline with a relatively modern product (some airlines have rather outdated first-class cabins that are below modern business standards), you’re looking at a suite with a door, aisle access from every seat, and probably lots of food and alcohol. Sometimes, more than that. The current apex of this is Etihad, who has the First Apartments on their A380, in a 1-1 configuration, and the 3-room Residence. Both Etihad and Emirates have showers on their A380s as well. There are a bewildering variety of planes and seating configurations in use today. What I've given here is only a broad outline, and I'm sure that many people are working on things to make it obsolete. But this should at least give some idea of what you might expect to find in the air today. Do you think that narrowbody long-haul point-to-point flights between big, but not hub airports (something that could be serviced by 320LR and the like) could be cheaper than two flights as hub>spoke? Or, since plane is smaller and people would be more likely to pay extra for direct flight, it will always be somewhat more expensive? Could low-cost airlines enter this market? It's hard to say. The 321LR is fairly close to the 757 in terms of performance, although it's cheaper to operate. And that didn't lead to a huge market for point-to-point operations. Various low-cost airlines have been doing their best to make secondary-to-secondary links work using narrowbodies, but the current troubles of WOW, Norwegian, and their other counterparts haven't exactly covered this model in glory. Of course, those are presumably trying to route around big cities, which limits the utility of this model. I'm sure there's demand for a 321LR from London to (say) Providence, RI, but that means a slot at a London airport, and those are notoriously full. Much better to route through Boston on a 777 or something. Are any 747s still in passenger service? I thought all the passenger 747s had been retired and that the only ones that remained flying were cargo haulers. Why is priority boarding a desirable feature? I want to spend as little time as possible on board the aircraft. First-on/first-off seems the luxury option to me. Admittedly, I am not spending my time in a Ethiad first class suite with a private masseuse tending to my every need. So I can see that would be different. D'oh! I meant LAST on/first off would be the most desirable option. I can see where you're coming from. Getting on first means that you have a much easier time boarding, but also have to be in your seat for the longest time. Most notably, the overhead bins are empty. Most people who have status presumably don't mind being on planes that much, so it's not a real issue for them. Personally, I'd take priority boarding as currently implemented. What exact change made the likes of the 787 more economically viable than the Jumbo? Was it changes to the planes themselves or the supporting infrastructure? The planes themselves. The big improvement has been in fuel efficiency, although they also take less maintenance. And a 787 is a lot smaller than a 747, which makes it easier to fill. That means you can run routes with less demand, because you need most of the plane to be full to make money. So is a full 747 or A380 still cheaper from per person than a normal widebody? But unless you're going between two megacities, flying nonstop in a less efficient plane is cheaper than having to connect at both ends of a longhaul jumbo flight, Correct? Probably, although it depends on what generation of 747 you're talking about. Modern airliners are all very efficient, and the numbers that are publicly available are not particularly consistent.